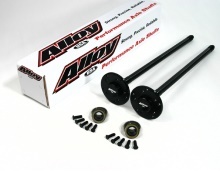 High tensile strength 4140 Chromoly is heat-treated, tempered and induction hardened to produce these heavy-duty axles that are up to 35% stronger than stock 1040 axles. Alloy USA uses the latest splining technology, to produce splines that are stronger than traditional cut splines. Our shafts are covered by an exclusive 10-year warranty! Rear axle shaft kits include everything you need for your installation: both passenger and drive side shafts, seals, bearings and wheel studs. Upgraded spline counts for Jeep applications: Dana 35 spline upgrades from 27 splines to 30 splines. Dana 44 spline upgrades from 30 splines to 33 and 35 splines.